To even be considered one of the greatest hitters in baseball history, one accomplishment must be attached to your resume; collecting over 3,000 career hits. 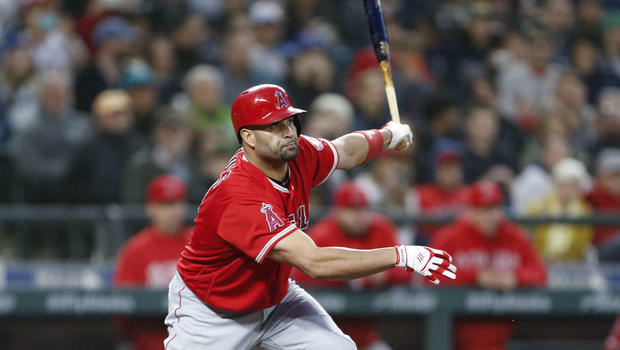 Current Los Angeles Angels 1B Albert Pujols accomplished that on May 4, 2018. He had already hit over 600 home runs in his career the previous season and that alone would qualify him as a first ballot Hall-of-Famer. When he burst onto the scene during the 2001 season, not many baseball fans outside of St. Louis knew what they were witnessing. Most die hard Cardinals fans’ at the time figured he would turn into a super utility guy since he was playing third base and left field when he was first called up. The production never dropped off and he continued to thrive. He won two World Series titles with the Cardinals and three National League MVP awards with them as well. A lot has been said and criticized about the Angels paying Pujols the contract that he received in 2012. It mainly comes from the fact that his production is no where near what it was for the Cardinals. To those that only look at the stat sheet, Pujols is providing the Angels exactly what they needed at the time. A superstar that goes about his business the right way both on and off the field. No one knew it at the time, but Mike Trout was about to burst onto the scene in 2012. Anyone who watches the Angels on a daily basis will tell you that Pujols has been a tremendous influence on Trout since he debuted. And for that matter every single player that has played for the Angels since Pujols’ arrival will attest to his leadership in that locker room. The numbers aren’t earth shattering in Anaheim, but he has still managed to never strikeout more than 100 times in a season. His highest was 93 and that was only done twice in his 18 years of service. The consistency is staggering and I can only compare it to one Vladimir Guerrero who will be inducted into the Hall of Fame later this summer. Congratulations to Albert on another notch to his Hall of Fame career. Oh and he is only 63 RBIs away from 2,000 for his career as well. How many players have 3,000 hits, 600 HRs and 2,000 RBIs for their career? Only two; Hank Aaron and Alex Rodriguez. This entry was posted in Baseball and tagged Albert Pujols, Angels, Baseball, Cardinals, MLB. I say definitely. He was unbelievable in his prime. Just like you said, the consistency is insane. He went something like 10 straight years w/ a line of .300 BA, 30 HR, 100 RBI under his belt while never striking out. He was consistently dominant.